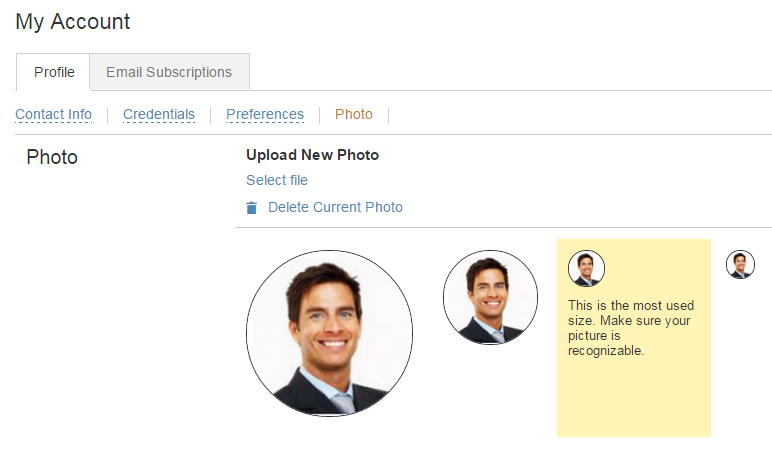 To edit your your Profile, select the user menu with the drop down option next to your name and avatar and then Profile. After making changes be sure to click the Update button to save changes. Contact Info contains most of the information others see about you and determines how iMeet® Central contacts you via email. First name - A required field. This is the first name displayed to other members of your workspaces. Last name - This is the last name displayed to other members of your workspaces. Primary email address - The main email account you use with iMeet Central. Emails from iMeet Central will be sent to this address. This shows by default in the Our Team tab when enabled. Alternate e-mail addresses - This field is optional. If you send from multiple email addresses, it is highly recommended that you include all those email addresses in this field. If you ever email into iMeet Central from an email address not included in your profile, the email will be rejected. Department - (Optional) This shows by default in the Company Directory tab when enabled. Job Title - (Optional) This shows by default in the Company Directory tab when enabled. Business Phone - (Optional) This shows by default in the Company Directory tab when enabled. Web Site - (Optional) The URL of your web site. Additional notes to be displayed in your public profile – This field allows you to add information which will be displayed to others when they view you profile. Some companies will include additional custom fields here which are specialized for the company’s purposes. For example, some companies include who you report to or what credentials you hold. Credentials is where account specific information, such as username and password are located. Username - This displays the username you use to login. If you would like this changed, click the Change Username link to change to the username of your choice. Note usernames are unique to all of iMeet Central, not just individual companies. Password - Using the Change Password link you can change the password you use to log in. Instant Messenger - Use the drop down menu to select your preferred instant messaging program. Instant Messenger Name - Enter your instant messaging name here. Note, this information will be available to other iMeet Central users within your company or team. Internet Phone Service - This drop down can be used to select your internet phone service. Internet Phone Name - Enter your internet phone name here. Note, this information will be available to other iMeet Central users within your company or team. Profile preferences contains settings specific to your account, such as time zone and a nifty way to review your old completed personal tasks. Time Zone - Configure your correct time zone here. Event times on iMeet Central are automatically converted to your time zone, so that if a member in another time zone schedules an event, this event will show at the appropriate time according to your time zone. Start Calendar Week On - You can either display your Calendar with Sunday on the far left (starting on Sunday) or far right (starting on Monday). If a member is a part of more than one company it can be designated which company will be the primary company upon login. Members can then navigate between companies. On the Profile Screen select the Photo link. Click the Browse button to find and select your image (only .jpg, .png, and .gif images are acceptable), then click Upload. Then, crop your photo as desired.